Zuiko is the name of the camera lenses made by Olympus, from the first one, mounted in 1936 on the Semi Olympus, to the present day. All Olympus cameras use lenses made by the company, but the word 'Zuiko' is not mentioned on some of the cheaper point and shoot compact models. Zuikō is written 瑞光 in Japanese and can be translated as "auspicious optics" or "auspicious light". The name was adopted after a contest open to the company employees, being a contraction of the first characters of "Mizuho Kōgaku Kenkyūjo" (瑞穂光学研究所, meaning Mizuho Optical Research Institute), name of a branch of Takachiho Seisakusho (the later Olympus) founded to develop the camera lens. Where a lens is denominated with a letter before the Zuiko name (e.g. D.Zuiko or F.Zuiko) it represents the number of optical elements in the lens. The letter's placing in the alphabet corresponds to the number of elements present — so a D.Zuiko lens has 4 elements, and a F.Zuiko has 6. Olympus began to phase out these letter designations when introducing new products in the early 1980s (e.g. the XA-3 and XA-4). Early Zuiko lenses were numbered in a single sequence, starting at 1000 or 1001 with the 75mm f/4.5 lens of the Semi Olympus. There were a few jumps in the sequence, which was notably reset at 20000 when production was started again after 1945. The original sequence went well past 120000, and further batches were started, e.g. at 300000 (for the Olympus Chrome Six III) and 370000 (for the Elmoflex). All these numbers were engraved with a No. prefix. In 1953, the common sequence was dropped, and each lens type received its own number sequence, distinguished by the absence of the No. prefix. The lenses mounted on Olympus products had their numbers reset at 100000, and those sold to other camera manufacturers had higher batch numbers, e.g. starting at 400000 for the Elmoflex III-F. Some lenses mounted on Olympus cameras, such as the Zuiko F.C. 7.5cm f/3.5 of the Olympus Chrome Six III, successively received the two numbering schemes. This apparently caused some confusion to customers who feared that the new lenses — without No. prefix and with a serial number reset at 100001 — were fake. 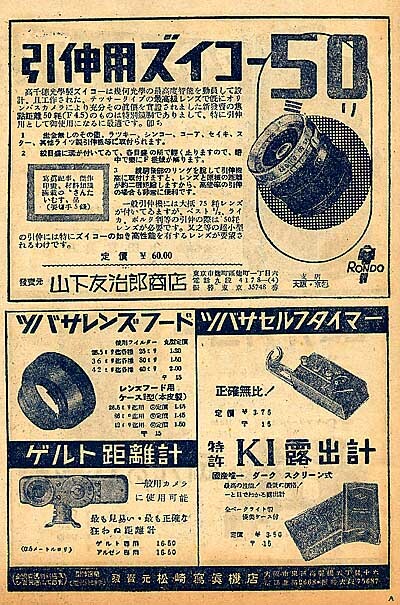 The Olympus company placed an advertisement in the November 1953 issues of Asahi Camera and Shashin Kōgyō to explain the matter. A range of 'Zuiko Digital'-branded lenses developed for the Four-Thirds digital SLR system. See Four-Thirds lenses for further details. A range of interchangeable SLR lenses for the half-frame Pen F system — see Olympus Pen F lenses for further details. A single lens was made in Leica screw mount; see Zuiko 4cm f/2.8 for Leica. Other Zuiko lenses may have been remounted for Leica by third-party workshops (see the high-aperture lenses below). A single lens was made in Exakta mount; see Zuiko 4cm f/3.5 for Exakta. A small range of interchangeable lenses in 42mm screw mount was developed for the Olympus FTL; see 42mm screw lenses for further details. A large range of interchangeable lenses for the 35mm OM system was developed over a period of thirty years; see Olympus OM lenses for further details. Interchangeable lenses of the Olympus Standard: see Olympus Standard. The first prototype lenses made by Takachiho in 1936 include the 75/4.5 mounted on the Semi Olympus, a 105/4.5 for 6.5×9cm format (listed below), and perhaps a 75/3.5. It seems that the projects were first designed with a focal length of 50mm, then a 65mm version of the Zuiko f/2.7 and Falcon f/2 was planned for the Olympus Standard. It is unclear if any of these lenses were actually made. The Olympar f/1.5 design later evolved as the Zuiko 50/1.5, which was produced in small quantities and sold to Shimazu Seisakusho for X-ray cameras made around 1940. It seems that some of these lenses appeared on the market after the war in Leica screw mount, perhaps sold by Shimazu as surplus. ↑ Maitani, "Kamera-zukuri he no bōken"; Sakai, p.7 of Kurashikku Kamera Senka no.20; Francesch, p.19. ↑ Advertisement in Asahi Camera November 1953, p.157. ↑ HPR, p.410, also mentions a Zuiko 90/4 and a Zuiko 135/3.5, both with a question mark. The existence of these lenses is dubious. ↑ The 75/3.5 is only mentioned in Sakai, p.7 of Kurashikku Kamera Senka no.20. ↑ Hagiya, p.13 of Kurashikku Kamera Senka no.20. ↑ Sakai, p.7 of Kurashikku Kamera Senka no.20. "Orinpasu kamera shisakuki 2-shu", p.59 of the same magazine. Japanese optical glass: Sakurai Eiichi, p.67 of the same magazine. ↑ "Orinpasu kamera shisakuki 2-shu", p.59 of Kurashikku Kamera Senka no.20. The Zuiko 65/2.7 and Falcon 65/2 appear in an advertisement for the Olympus Standard dated August 1937, reproduced in Kokusan kamera no rekishi, p.62. ↑ Sakurai, p.67 of Kurashikku Kamera Senka no.20, seems to imply that they were not. ↑ Sakurai Eiichi, p.67 of Kurashikku Kamera Senka no.20. ↑ Sakurai and Saeki, p.67 of Kurashikku Kamera Senka no.20. HPR, p.410, mentions the Zuiko 50/1.5 in Leica screw mount, and also mentions a 50/1.1, certainly a confusion. ↑ Examples pictured in "Orinpasu renzu hoi", p.81 of Kurashikku Kamera Senka no.20, and observed for sale at a dealer and in an online auction. ↑ Example observed for sale at a dealer. ↑ 13.0 13.1 13.2 Mentioned in "Orinpasu renzu hoi", p.81 of Kurashikku Kamera Senka no.20. ↑ Advertisement dated 1941, reproduced in Nostalgic Camera by Toshio Inamura. ↑ Example pictured in this page at Red Book Nikkor (lens no.139597). ↑ "Orinpasu renzu hoi", p.81 of Kurashikku Kamera Senka no.20. The example pictured has no.104603. Asahi Camera. Advertisement by Olympus Kōgaku Kōgyō in November 1953, p.157. HPR. Leica Copies. London: Classic Collection Publications, 1994. ISBN 1-874485-05-4. P.410. "Orinpasu renzu hoi" (オリンパスレンズ補遺, "Olympus lens appendix"). Anonymous column about various Zuiko lenses. Kamera Rebyū: Kurashikku Kamera Senka (カメラレビュー クラシックカメラ専科) / Camera Review: All about Historical Cameras no. 20, 25 March 1992. No ISBN number. Orinpasu no subete (オリンパスのすべて, special issue on Olympus). P.81. Shashin Kōgyō. Advertisement by Olympus Kōgaku Kōgyō in November 1953, p.341.